Cottages are set in a park-like surrounding on 10 acres of a choice cedar woodland grove providing privacy and comfort on the beautifully treed shoreline of Sturgeon Lake. Beautiful sandy beach suitable for all ages - marked off for children - great for swimming and sunning. 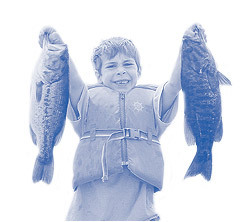 Avid fishermen, novice to expert will be able to match their wits against fish of several species... Bass (largemouth and smallmouth), Pickerel (Walleye), Muskellunge, Perch and Panfish. Spring and fall fishing can be most rewarding! We recommend practising live release so that future generations will also be able to catch fish!